Brand New 10'x10' Gazebo Canopy Replacement! Perfect to Make Your Gazebo Shiny and Refreshing! Enjoy outdoor living space without sun burn from now on. This canopy top replacement for your gazebo could bring you a new life for relaxation and refreshment. It will stand a severe test for year round to provide you pleasing and cozy get-together with your family or your friends. 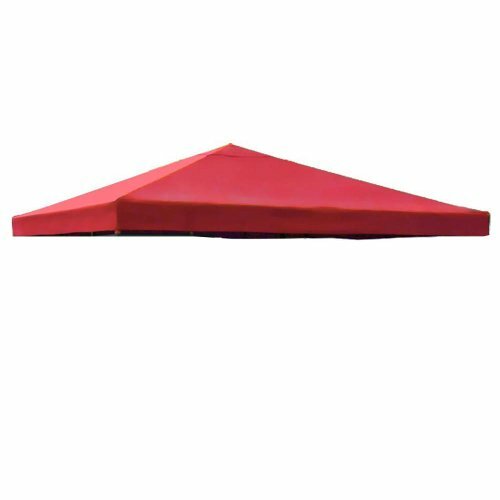 Canopy top replacement fits for 10' x 10' One-tier gazebo frames. PA Coating for effective harmful UV blocking and waterproof performance. Grommets to ensure proper water drainage. Reinforced corners to stand years of use. Velcro attaching tabs for conveniently fixing onto the frames. Top Dimension: 121" x 121"
Gazebo frame is NOT included. As the gazebo size varies, please check your gazebo and the specification above carefully for best match. It will fit better if the gazebo frame is a little smaller than the top.